Popis Author Nathan A. Good includes syntax references only when necessary. Languages covered include Perl, PHP, grep, vim, Python, and shell. Web and applications developers, and system administrators will find the examples both accurate and relevant. 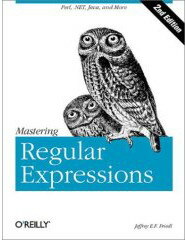 Popis In addition to working examples and best practices, this book features a detailed API reference with examples supporting nearly every method, and a step-by-step tutorial to create your own regular expressions. Popis Developers using ASP, C#, ColdFusion, Java JSP, PHP, Perl, Python, and more can (and should) be using RegEx, and so every one of them is a potential reader too. This tutorial book is organized into a series of easy-to-follow 10-minute lessons.